While NyxQuest [99¢/Lite/HD/HD Lite] may be new to iOS platforms, it is not a new game. Chillingo’s greek-themed platformer has already been praised in its WiiWare incarnation, and it’s also been available for PC and Mac via Steam since late last year. The question we have been mulling around since the game first popped up for discussion on our forums was an obvious one: Would we get a beautiful translation of the game for our portable devices, or would it merely end up being a shabby port? For those of you unfamiliar with the game, you take on the role of Nyx, a winged woman who has come to earth to seek out Icarus, a mortal man who used to spend his every moment by her side. A terrible spat between the gods down on earth has left things in a bit of a shambles, and it’s up to Nyx to find her way around and figure out what has happened to Icarus. If you played the atmospheric WiiWare launch title Lost Winds, you will certainly think of it at least once while playing this game. Also a sidescroller with a distinctive look, NyxQuest will have you moving back and forth and flying your way through beautiful levels in search of your friend. Movement is simple and controlled by sparely placed buttons — all you need is a forward and backwards arrow to move and a button to jump (or if you hold it down, you can float). The simplicity is lovely, and I found myself quickly immersed as I lost myself in the music and the puzzles that stood in my path. No greek-themed game would be complete without encounters with the gods, and NyxQuest is no exception. As Nyx progresses, she will be granted new powers that will allow her to progress by dudes you may have heard of (like Zeus. You know, that guy). Soon you’ll be moving blocks thanks to his almighty gift, and the puzzle solving becomes slightly more complex. Luckily, there are many checkpoints in each level, and you never have that classic retro-flavored frustration of being returned to the very beginning of the level to do it all over again. NyxQuest provides a decent level of challenge, but I never found myself agonizing over any of the puzzles, so I wouldn’t call it a head scratcher. In fact, its actually a relaxing gameplay experience thanks to an absolutely gorgeous world rendered to perfection and a memorable musical score that really lends to the game’s dreamy feel. My only complaint is that I wished that the game was longer. The addition of new skills as you progress helps to freshen the gameplay and keep you going. 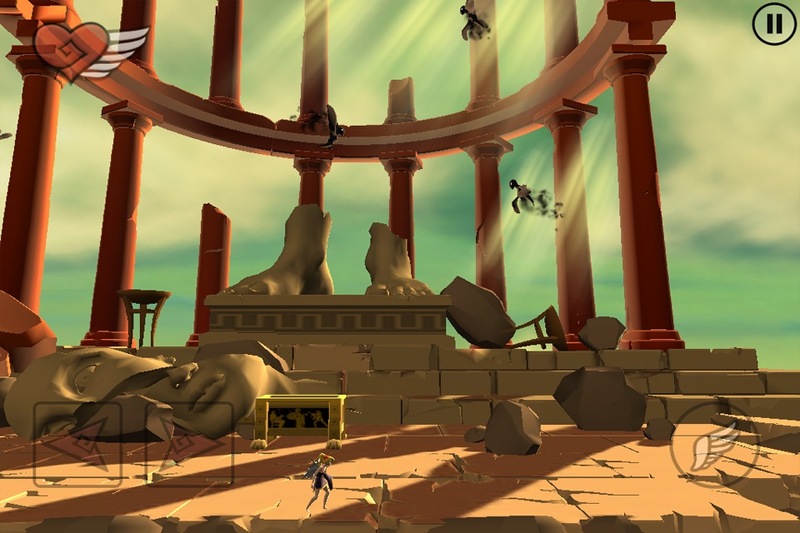 Twelve stages are available, and by collecting a series of the Gods’ relics, you can unlock a thirteenth. That seems like a lot of levels when I type it, though … maybe I’m just being greedy because it’s a great game. For the price, this is one hell of an adventure, and the gameplay experience is just about as refined as can be. Players in our forums seem to be digging it as well, so pull on your winged sandals and get in there. You need to track down this Icarus guy before the Gods get any angrier, and heaven known we don’t want to incur any more of their wrath!